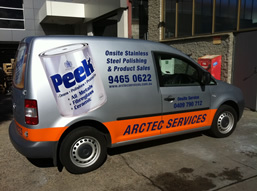 On-Site Stainless Steel Polishing Service - We come to you! Are you constantly looking at stained metal surfaces? Does that discoloured balustrade in your foyer embarrass you when clients come to visit? Don't put up with stained metal surfaces any longer! Book an on-site polishing service today. We service all of metropolitan Melbourne - we come to you! We also work with municipal councils to regularly maintain public property. Cleans, polishes, restores and protects 38 surfaces - brass, copper, stainless steel, silver, gold, chrome, fibreglass, ceramics, glass, acrylics, painted surfaces and many more. The easiest and most economical product to use. No spills, residue, odour, cloth saturation or mess. The most universal product available. Use on silverware, bar taps, faucets, chandeliers, counter tops, sinks, mirrors, porcelain, and more. Book an on-site polish today! Call us now on 03 9465 0622. 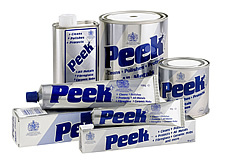 To purchase Peek Polish for your own use, please call us on 03 9465 0622. Arrange a no-obligation free quote for your project. © 2012- 2019 Arctec Services.